The Equal Rights Trust provides those at the start of their career in human rights the opportunity to gain essential experience in internship and fellowship positions. 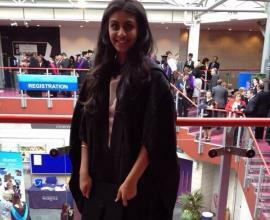 In December 2015 we spoke to Rupal Shah our former Legal Research Intern to ask her how she has found her experience and what she thinks about the Trust’s internship scheme. Could you explain a bit about yourself and your experience? I obtained an LLB from Warwick University. Before I undertook the internship with the Trust I had interned for various unpaid or minimum pay legal internships, all of which provided a superb experience and I was able to meet some great people. I was keen to understand if pursuing law was for me, and by interning I was given different avenues to find this out. What did you learn working as an intern with the Trust? In my role as a legal intern with the Trust, I carried out two main activities. The first focused on helping to edit the Trust’s Equal Rights Review which saw that I carried out its proof reading, editing and referencing. My second role focused on researching policies and legal policy issues around the world, the tasks I carried out included drafting summaries for recent equality and non-discrimination cases for the Trust’s website and compiling research memos on legal and policy submissions including amicus curiae briefs. Working in a small and proactive team at the time allowed me to be involved in a number of projects the Trust undertook and to see through these tasks from beginning to end. Do you think your experience at the Trust helped you to gain paid employment? I currently work in sales in an asset manager, which is obviously entirely different to what I did at the Trust. However, everything I learnt was transferable. My internship showed my new employers that I had more commercial sense than someone coming straight from university, and I also gained experience in regards to learning how to act in a professional environment which was an invaluable asset for me. How would you describe the internship overall? My internship was an eye opening experience, particularly for learning about various issues which I had no previous exposure to, such as discrimination against Rohingya. The Head of Litigation, Joanna Whiteman was my first mentor and gave me an excellent understanding on the importance of reliability. Furthermore, everyone in the office was very friendly. I'm still in contact with Joanna now, three years on from my internship, and I continue to assist in activities concerning the Equal Rights Review – an experience I’m extremely grateful for. The internship added value to my CV - it was very helpful for my employers to see that I had been active and had experience in research and editing a major publication.